Nissan is expanding the NISMO performance brand to include the Nissan GT-R NISMO that will be the flagship and the fastest-ever production GT-R. See what record they really want. Nissan has just announced that the NISMO performance and racing division is expanding to include the flagship of Nissan's performance and technology efforts, the Nissan GT-R. Nissan already has the 2013 Juke NISMO, 2014 Nissan 370Z NISMO and announced it will build the fastest-ever GT-R NISMO. Nissan's Motorsports brand, NISMO, is growing and changing beyond the racetrack. When will we see the new higher-performance GT-R NISMO? It was reported by AutoExpress that the new GT-R NISMO will make its global debut at the Tokyo Motor Show next year. While that is a long time to wait, Nissan is reported to be testing the prototype now and has been driven by Nissan executive vice president and global manager of product planning Andy Palmer. What track record does Nissan really want? While Nissan did confirm the new GT-R NISMO will make it to production, they didn’t give any details in their press release. Palmer talked to AutoExpress and told them limited information but did say that the new GT-R NISMO is “bloody quick. It will be the fastest GT-R ever.” That means the current sports cars power will be increased even more from the 543 horsepower. Palmer also said, “It will deliver an extra kick.” It will be interesting to see how much NISMO will improve on the already quick 0-62 mph sprint time of 2.7 seconds. Like the Nissan JUKE NISMO, and 370Z NISMO, the new high-performance GT-R NISMO will get styling tweaks to set it apart from the standard model. These design changes will allow the faster GT-R to have better aerodynamics for higher speeds. “The visual changes will be geared to providing more downforce,” confirmed Palmer. In the interview with AutoExpress, Palmer confirmed the new GT-R NISMO will be the flagship for the NISMO performance brand and he said it will have a specific target for the supercar. “The production car record for the Nurburgring is the gold standard, and we are aiming for that,” he confirmed. This would be a huge feather in the cap of Nissan if they can pull it off. As most automakers are doing, they use their knowledge they gain from racing to be implemented into their production cars. NISMO engineers are putting information gained in Japan’s Super GT race series while developing the car. 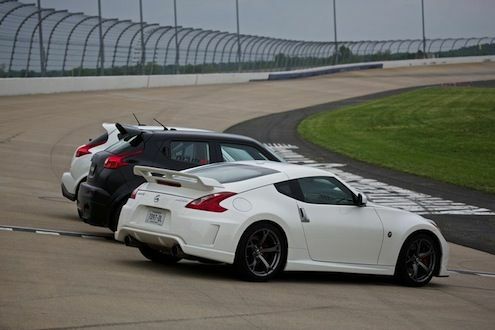 Nissan kicked off their expansion efforts with a special NISMO event for media at the Nashville Superspeedway. It was an event to provide a glimpse into what is new, and what is coming next. Both the 2013 and 2014 Nissan 370Z NISMO, the JUKE-R, the 2013 Nissan JUKE NISMO, and the 2014 GT-R Track Edition were on hand for the special event. Nissan chose the race track for a specific reason to talk about the new GT-R NISMO. Carl Phillips, chief marketing manager, NISMO and Nissan sports car marketing - Nissan North America said at the event, "We think the track is a perfect place to showcase NISMO because NISMO is Nissan Motorsports. It's the racing, the motor sports heritage that has inspired cars like the new JUKE NISMO, and it's about bringing that excitement from the track to the street,"
The Juke NISMO, is already on sale in Europe and Japan and launches in the United States in the spring. The 370Z NISMO is now in its second generation in the U.S., with a revised 2014 370Z NISMO and is set for sale this summer. Nissan says we can expect a “rapid pace of introduction of even more NISMO models” in the coming years. They say they will introduce at least one model every year during the Nissan Power88 period, encompassing the breadth of the Nissan model range. We will look for the fastest-ever GT-R NISMO to make its global debut next year in Tokyo. And we can't wait to see if the GT-R NISMO can beat the Nurburgring production record.